Still, it was not until his temporary emigration to Paris in 1920 that Kakabadze developed a distinctive and original style of painting, for until that moment his landscapes and portraits had been highly structured and controlled exercises in a late pointillisme that had little in common with the more radical conclusions of his St. Petersburg and Moscow colleagues. Beginning in 1920, however, Kakabadze pursued a more experimental path that brought him to his planar experiments in Synthetic Cubism and Purism in which the intellectual problems of pictorial construction, spatial definition, and compositional arrangement were of central importance to the artist. He wrote in one of his theoretical tracts: "In a painting each part, each plane, each line and each colour should occupy its own place and no part of the painting should be superfluous [so that] if the question-what's that for?-is asked, the response should derive naturally from the constituent parts of the painting." In the 1920s Kakabadze painted a number of compositions such as this untitled piece, especially within the cycle called Paris (1920), many of which are still in the family collection in Tbilisi. In particular, the work in question bears a close resemblance to the 1920 Landscape, sharing the same bridge composition, leaning buildings, and billboards as well as basic colours of cream, brown and grey-green. True, Kakabadze interchanged his commercial references (Dubonnet, Cinéma, Petit), but his fascination with the new architecture and streets of Paris remained an integral part of this cycle. 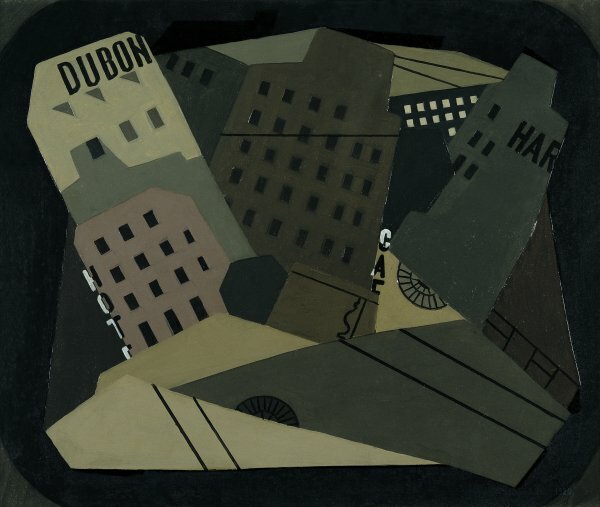 As in other Parisian scenes in this cycle, Kakabadze emphasises a flat, two-dimensional pattern through a strict arrangement of irregular planes. These carry geometrical ornaments that are reminiscent of wallpaper or a tapestry and this concern with the surface combined with the restrained monochrome of browns and greys brings to mind the concurrent researches of the French Purists. Kakabadze explored his ideas in a variety of disciplines, figurative and non-figurative, including abstract reliefs and sculptures as well as paintings. Acquainted with many artists in Paris, including Gris, Matisse, Ozenfant and Picasso, Kakabadze retained his artistic identity and applied his energies to many different activities, even inventing and patenting a stereo-cinematographic apparatus. Not surprisingly, however, Kakabadze returned to a more realist style after his homecoming to Soviet Georgia in 1927, thereafter concentrating on industrial landscapes and scenes of Georgian architecture.